HOW DID YOU FIRST BECOME INTERESTED IN ALL THINGS AVIATION? WHAT ABOUT THE SPACE PROGRAM? DID YOU SEE THE LAUNCH? TELL US ABOUT YOUR FIRST FLIGHT IN A WORLD WAR II PLANE. HOW MANY FLIGHTS HAVE YOU TAKEN IN THESE PLANES? WHAT ELSE HAVE YOU FLOWN IN? DID YOU DO ANY RECENT FLIGHTS OR HAVE OTHERS COMING UP? Neil A. Busis, MD, FAAN, has flown all types of WWII planes, and once passed himself off as press (as an 18 year old) to see the Apolo 11 space mission launch up close. Here he shares what it feels like to fly in the same planes that blasted bombs through Berlin and to watch up close rockets soaring into space. Most of his working hours are spent serving as head of the UPP Neurology Service and directing the Neurodiagnostic Laboratory at UPMC Shadyside in Pittsburgh, or serving as principal investigator of the AAN's research studies on burnout, career satisfaction, and well-being in U.S. neurologists. But when time permits, Neil A. Busis, MD, FAAN, indulges in a fascination he's had since childhood: aviation and space flight. Dr. Busis has a particular interest in World War II aircraft and frequently travels to air shows that offer opportunities to fly in those historic planes. Dr. Busis spoke to Neurology Today about his twin passions of flying and exploring the outer limits of space. When I was a kid, I built a lot of model airplanes. I had about 160 of them! My dad was a flight surgeon in World War II. He was never shipped overseas because he was in medical school, though. He graduated in 1945 when the war was almost over; he had orders to go but they cancelled them. But a lot of my dad's friends were in the war. One was a B-24 pilot in Italy. He never lost a person. Another was a navigator in a B-24 who was shot down over France. He parachuted out of the plane and broke his leg when he landed. He was rescued by the French Resistance and repatriated. These were people that I knew growing up, so I naturally had a fascination with these planes in particular. YOU HAVE A SIGNED LETTER FROM NEIL ARMSTRONG. HOW DID YOU GET THAT? I figured out the crew rotation system. One of the original Mercury 7 astronauts, Deke Slayton, was deemed unfit to fly because of a heart problem shortly before his flight, so he became NASA's first Chief of the Astronaut Office and assigned all the crews. I studied all of the rotations his office created and who was the backup on each mission, and I figured out that the backup crew of a flight would be the primary crew three missions later. Months before it was announced, I figured out that Neil Armstrong would be the first man on the moon with the Apollo 11 mission. So I wrote him a letter and told him I thought it would be him, and I received a signed letter from him in response. Yes, my high school graduation present was to go down with my dad and watch the Apollo 11 launch in July 1969. It was astonishing. I went to a friend who worked for the Pittsburgh Post-Gazette and got him to give me a flimsy letter that said I was a reporter. I was only 18 but I'd learned that when you have a coat and tie on, people believe you. So I went to the press building and the guy there asked, “What does this letter mean?” I said, “It means you should give me everything that goes with the press for the Apollo mission,” and he said okay. So I got full press credentials, all the briefing books, all the manuals. I still have those! We got a tour of the vehicle assembly building with my press pass. They were doing these missions really fast: Apollo 11 was in July, Apollo 12 in November, and April 1970 was Apollo 13. So we saw the Saturn 5 and Apollo 11 on the launch pad, the Apollo 12 in the vertical assembly building — so big it had clouds at the top — and parts of the Apollo 13 getting ready. I got to touch part of the Apollo 13. I hope that didn't jinx them! They launched around 9:30 am. We wanted to get a good spot, so we got there at 3 am and we got lost, ending up near the VIP stand. It was guarded and no one was there yet, and the guard at first mistook my dad for Vice President Spiro Agnew! We said no. We ended up parking on the road like everybody else. You have to be really far away from the launch because if it blows up, you're done. That's one of the reasons the Soviets lost the moon race. This isn't generally well known, but they were very close to being the first people to land on the moon. There was a launch pad accident with a missile prototype in 1960 — they had this gigantic rocket on the ground and were ready to launch it for a test flight. They call for the launch, and nothing happens. Everybody goes out to the pad to see what's wrong, and the rocket blows up, killing them all. It was a huge loss for the Soviet space program and it wasn't even revealed until after the end of the Cold War. What you don't see on TV is that the flames coming from the bottom of the rocket cover the entire horizon as far as you can see. It's so noisy that you don't hear it, you feel it — seven million pounds of thrust. It was the most amazing thing I have ever seen. I never thought about the availability of these planes to fly in until about 10 years ago. There was an article in the paper about an organization that restored these old war birds having an air show at our old Allegheny County Airport, which has since been replaced, and you could tour these things. I saw the same plane my dad learned to solo in. I walked through the B-24 and the B-17. I learned there are several different organizations that restore these planes. To support their restoration efforts, they sell seats on flights. Some tickets are to sit anywhere in the plane and some are for specific seats. You take off and land from the same airport. You are not high enough to require an oxygen mask. I have flown in a B-17 three times, a B-24 twice, once in a B-25, and once in a B-29 — the type that dropped the A-bomb. I flew in the radio operator's position a couple of times in a B-17 and B-24. There's a a big electronic box that's the size of a refrigerator which is a jamming device, but it could only jam three frequencies of German radar. Now my Apple watch could probably do that. None of these planes were designed to be very comfortable, shall we say. In the B-29 bombardier's position, the seat is a little 1.5-inch pad that is in a depression between the copilot and the pilot's instrument panels. It has no back. They'd fly 16-hour missions to these little islands in the Pacific and the bombardier would sit there for that whole time! The B-17 and the B-24 weren't even pressurized. There's a nine-inch wide walkway through the bomb bay from the front of the plane to the back, and you can see the ground through the bomb bay doors, which don't close very tightly. If the doors jammed in a B-24, they'd drop the bombs anyway and they would go right through the flimsy doors. If they would fall through those doors, so would you! In the B-25, a medium bomber, there's a little tunnel under the pilot to go to the bombardier's position in the nose. You have to lie on your back and pull yourself through with these rails positioned above you. If you went in any other way you couldn't get out into the nose. They weren't thinking of human factors engineering when they designed these! I've flown in two P-51s, the best US fighter plane of World War II. I've done rolls in them, which is amazing. Here I was in this plane, an actual P-51 that had flown over Berlin in largest raid of the war in 1945 — piloted by a guy from Philadelphia — which was then sold to the Honduran Air Force and made into a two-seater trainer. There's a big glass bubble canopy; you look out and there's just the sky above. When you turn upside down, what you see above you is ground and not sky, but you don't feel upside down. It's nuts. As a neurologist, I found it fascinating. I now understand why pilots who are instrument-rated say don't trust your senses, trust your instruments — that little ball tells you that you are upside down or right side up. That flight gave me insight into JFK Jr.'s death. He had just been instrument-rated and was flying in a storm to Martha's Vineyard, and what he probably did was not pay attention to his instruments but to his senses. That can get you into a dive you can't recover from. But it's totally counterintuitive to trust an instrument more than your own ears and eyes. In the spring of 2019, I'm booked to fly in the Avro Lancaster, the only one in the world still flying, in Canada. This past July, I went to the Flying Legends Air Show in Duxford, England, in July. It's the largest show for World War I and World War II planes in the world, at an old air base used by both American and British air forces in World War II. I flew in two planes I'd never flown in before. One was the biplane version of the trainer the British used, and also in the P51 Mustang Texas. Biplanes are very hard to fly. They're so light that every gust of air will get you off course. You're constantly adjusting or you'll crash. What these pilots did for their countries was just astonishing. In the spring of 2019, I'll schedule a flight in the Avro Lancaster, the best British bomber of the war. The only one in the world still flying that allows passenger flights is in Canada. This past July, I went to the Flying Legends Air Show in Duxford, England. It's the largest show for World War II planes in the world, at an old air base used by both American and British air forces during the war. I flew in two planes I'd never flown in before. One was a biplane trainer the British and Canadians used called the Tiger Moth, and also in a T-6 Harvard (the US called it the AT-6 Texan), an advanced trainer. Biplanes are very hard to fly. They're so light that every gust of air will get you off course. You're constantly adjusting or you'll crash. What these pilots did for their countries was just astonishing. The highest rates of fatalities were in the air forces. The average life of a World War I pilot was about three to six weeks. Flying in these planes really drives that point home, and brings me back to a different time. “Off the Clock” is a continuing series featuring neurologists and neuroscientists who pursue a rich array of hobbies, interests, and passions outside of their work. Want to nominate someone for a feature? Send your suggestions (and why they are good candidates) to NeurologyToday@WoltersKluwer.com. 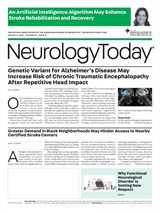 Neurology Today18(22):54-58, November 15, 2018.